I wanted to use a SiliconGraphics GDM-17E11 monitor on my Sun Ultra 10. My Syn Ultra 10 has a vga output, and the monitor has a 13W3 input, which requires Sync-On-Green. 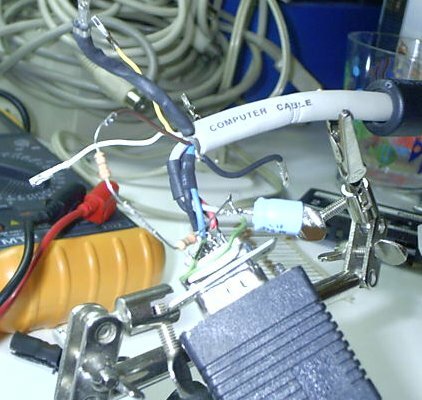 That's why I needed to find a way to convert VGA to RGB SyncOnGreen. Usually, there are 5 important signals coming out from a VGA card. The colors (Red, Green,Blue) and Sync (H-Sync and V-Sync). The voltage on the color signals is proportional at the brightness of the color at a given moment. The Sync signals are generally kept high, with short low pulses when retrace must occur. Some monitors support or need Composite Sync (C-Sync). C-Sync is both H-Sync and V-Sync pulses combined together with a simple circuit(dont try connecting the 2 wires together). The monitor can differentiate between H-Sync and V-Sync by looking at the pulse width. The V-Sync pulse is longer. Old sun monitors required C-Sync, and I guess that's why C-Sync comes out of my Ultra 10 instead of V/HSync. Some monitors requires the C-Sync pulses to be combined with the Green color signal. That's the case with my GDM-17E11. It can be done with a very simple circuit, as demonstrated on this page: Circuit for converting spearate sync signals to SYNC-in-GREEN. Most schematics includes a part to combine V and H sync, but sometimes it is not necessary. Some video cards can be programmed to output C-Sync on the H-Sync pin (+csync). I case you are wondering, the sync pulse does not interferate with the green signal because the pulses always occur at the end of a line or at the bottom of the screen. As you can see on the picture above, it is easy to recognize which pulse is H-Sync and V-Sync. When I took this sample, my screen was totally black, but there was a small taskbar in the bottom. We can see how the task bar effects the voltage of the green signal. We can also confirm that the sync pulses occur at the end of a line by looking at the vertical line I drew. I chose to use the schematic I found on this page: Circuit for converting spearate sync signals to SYNC-in-GREEN . The transistor used to combine to add V-Sync to the H-Sync is not necessary anymore. The remaining components are necessary. This one works with +vsync and -hsync. 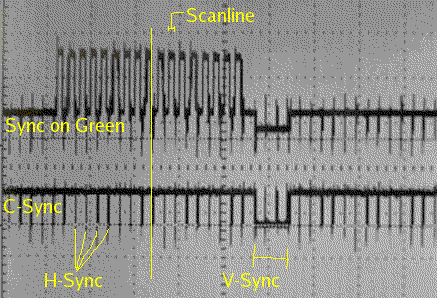 Transistor Q2 is chopping -hsync using +vsync to obtain -csync. Transistor Q1 only lets the green pass when -csync is active, generating Sync on green. Tested on a B/W tv using Powerstrip. The results were quite satisfactory. 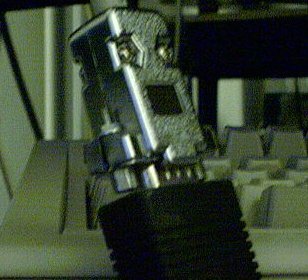 Fortunately, the components fitted inside the connector casing. 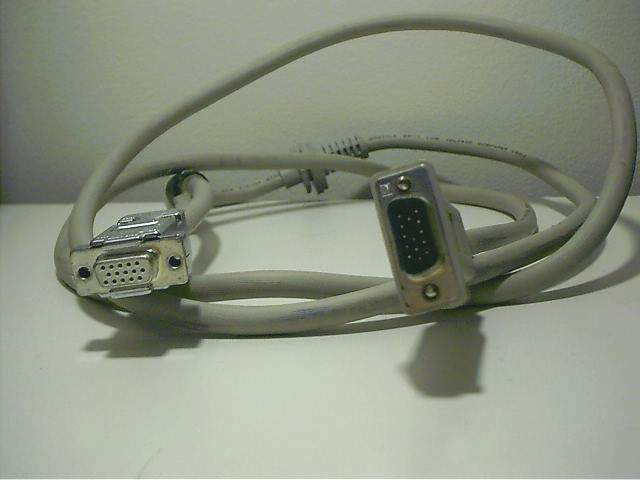 Here is the complete cable. 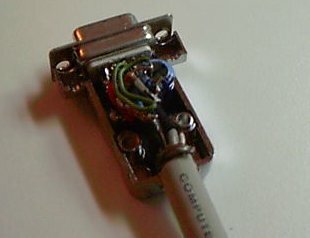 The Sync-On-Green output of the finished cable, in use.